Scott Heller (SH): How and when was the mighty Bongzilla born? BONGZILLA: BONGZILLA was born 10 years ago over a group of bongs. SH: How did you come to join the names Bong and Zilla? BONGZILLA: See the second half of question #1. The word was uttered and became reality! SH: What bands influenced you to enter into the dark murky depths of stoned sludge metal or whatever category you can call this kind of music? BONGZILLA: We grew up listening to Black Sabbath, Led Zeppelin, Lynyrd Skynyrd, Mountain, Blue Cheer, Nazareth, The Who, Captain Beyond, Black Oak Arkansas, etc. These days we listen to Eyehategod, Melvins, Cavity, Sleep, High On Fire, Mastodon, Unsane, Today Is the Day, SunnO)))), Iron Monkey, etc. SH: No one is more obsessed with weed than BONGZILLA. When did you start to smoke? BONGZILLA: When I was 11 years old I smoked marijuana and listened to Sabbath, Bloody Sabbath on the same day. It changed my life! SH: Do you guys prefer the bong, the pipe or smoking joints? SH: How much do you think the bands live shows differ from the CDs? Do you improvise live? BONGZILLA: I feel you can achieve a better buzz from music in a live setting. We do improvise live and every time we jam we strive to reach the Iommisphere! SH: What is the longest jam you have ever had at a live show? BONGZILLA: 40 minutes of pure jamming. SH: How did you come up with the title of the new CD? Great artwork. 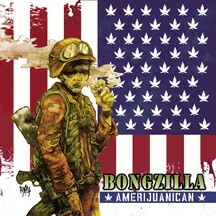 BONGZILLA: It's a commentary on our governments "War On Drugs". The lyrics pay both homage and are a mockery of the first lines of the national anthem. Up until recently I had been pretty proud to be born and raised in this country. Our government has always done crazy stuff, but it seems now we're blatantly lying to our own people. There are so many examples, the weapons of mass destruction, that the war was over... it's sickening. SH: Your new album 'Amerijuanican' seems like the most focused record you've done up until now. No intermissions or funny gags, nothing but downtuned heavy sludge from start to finish. Do you feel yourself that you've grown musically? BONGZILLA: We were going to use Towlie from South Park but the funny gags were censored. You can still hear the towlie samples on our MySpace page (myspace.com/BongzillaSmokes). We've both grown musically AND we view Amerijuanican as our Rock N Roll record. SH: Your version of Champagne and Reefer is a hell of a take off of the original. What do you think Muddy would think??? BONGZILLA: I think Muddy appreciates a good smoke. SH: A lot of Relapse bands have visited Denmark this year (HIGH ON FIRE, DILLINGER ESCAPE PLAN, UNSANE). But when will you be touring Europe and especially Denmark? I don't think you have ever played in Denmark? BONGZILLA: We are currently on hiatus while we make future tour plans. Throughout our history we've always taken breaks. Very often we tour right after the record comes out, but more often we take a little break and then tour. We will soon be returning full force again to smoke across the globe but no plans are set in stone. SH: Who can stand the most weed. BONGZILLA or WEEDEATER? BONGZILLA: After discussing this question with WEEDEATER we've decided that should you fund an event, supplying us with copious amounts of ganja, we could find the answer. However, neither of us can decide just how much reefer you would have to bring in order to come to a conclusion. We've estimated it at around 4 pounds... give or take... for the first week. And a subsequent 2 pounds per day following. Should you be interested in conducting this experiment, please feel free to contact us at bongzilla666@hotmail.com. SH: We hope to see and smoke with you guys in 2006! BONGZILLA: Thanks for the interest and support. Check out Amerijuanican and KEEP SMOKIN!